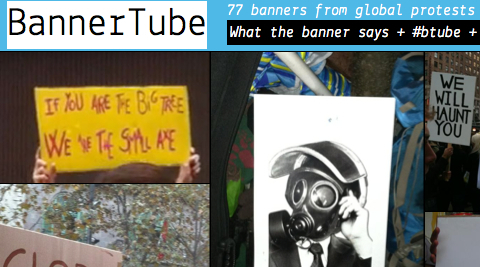 Bannertube is a collaborative application that tries to expand the significance of global protests through their images. It consists on collecting banner’s slogans that users around the world can upload to twitter and relate them with youtube’s videos through the keywords of the slogan. As a result, heterogenic narrative associations will be generated. It would be automatically added to the Bannertube’s images map. The slogan’s keywords will be used as tags to relate each banner with a sequence of YouTube videos that will generate a narrative. The arrows appearing on the video allow you to move through the videos related. You can close the banner you are by clicking on the X and then you come back to the mosaic where the banners are hosted.